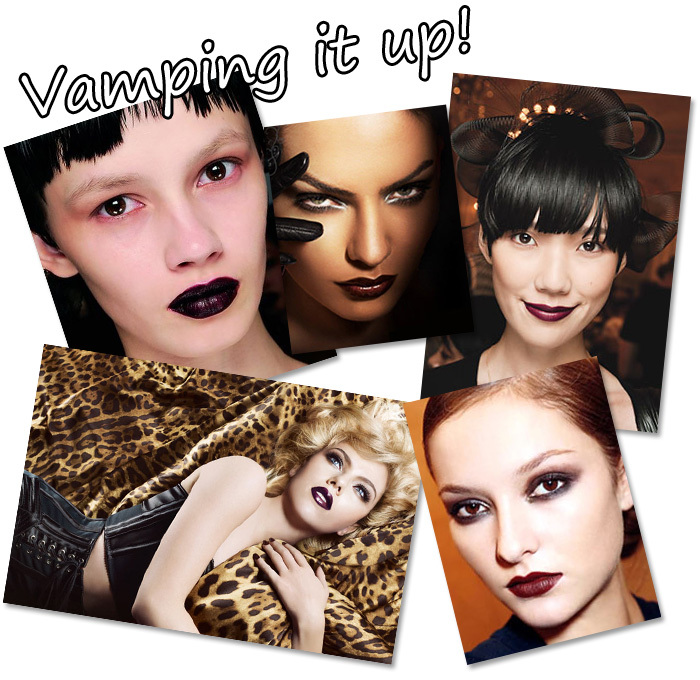 It’s that time of the year again… dark lips are gonna be out in force! I wanna know how you wear a great dark lip? I love the trend… especially for lazy days and bare eyes. My problem? I have a pretty thin top lip and dark colours make lips look even thinner! I always feel that these vampy shades make me look like I’ve got a MEAN mouth! I really want to put more effort into wearing some great vampy shades this season. Will you be wearing some dark lip shades this Autumn? Are you a bit nervous of the annual trend? If you’ve discovered any great tips – do share them, I’m sure that I’m not alone in needing some guidance! I have the same problem. I have thin lips and could never pull off these colours even though they are amazing and I love them. Not having a go at you (I agree it is a stunning picture) but I can’t call that a “shot” or a “photo” – that is a piece of digital art. I love love love dark lips! Make sure you add a touch of light on the centre of the mouth with a lighter color or a touch of gloss, that will help. Using a liner is a must with dark colors and to really define the lips, you can finish by going around the lines with a bit of concealer and a concealer brush. I have thin lips but I love this trend so i’m going for it anyway. I have chanel coco rouge in byzantin which isn’t too dark, its a berry red so I think i can get away with it. Try using a medium plum or a bright red, then going over it with a dark gloss. That was you get the dark colour AND the light reflecting qualities of the gloss. You could highlight your cupid’s bow, too. Always use a liner with dark lippies! apply highlighter to the skin above the upper lip, above the cupide’s bow. this makes the upper lip stand out more. Apply liner ever so slightly outside natural lipline on top lip and blend with lipstick. A little lipgloss to the cupid’s bow when your done will also make the top lip stand out more. Another trick i learnt is to find two lipsticks same tone, but one slightly lighter. put lighter one on top lip and darker one on bottom lip. Those pictures are beautiful! I love the trend but I just can’t pull off dark lips. I jsut bought Black Orchid lipstick from Make Up Store so will be using that one this autumn. I just need to figure out with what kind of make up and do I really want to use lipstick at work. I have luckily full enough lips even if they seem smaller after using dark lipstick. I love the dark lip trend and I know what you mean regarding smaller/thinner lips. I think to a certain extent it’s possible to slightly draw outside the natural lip line to get a fuller looking mouth, but in practice I don’t do that too much because I feel I look a bit too OTT for everyday. I like the two pics on the right the most — they look the most achievable and translatable to everyday. The woman in the pic on the far left has inspiring lips but I can’t see the red around the eyes working for everyone…and the Scarlett picture looks too photoshopped to try and aspire to…. I think it looks really pretty on girls with darker hair. I am blonde and i think it’s gonna be a little to much. The darkest I like for myself is a darker red color. I like dark lips sometimes. Mostly I go for bright lips…fuchsia, hot pink, and purples. You can try colors like MAC’s So Scarlet lipstick or Wrong Spell lipglass. You can take a color you normally like to wear and layer UD’s sheer Oil Slick lipstick on top or some other black gloss. I love dark lips, but I realize they’re not for everyone, so sometimes it’s best to slick on a darker gloss. I look younger than I am, so dark lips don’t look so good on me! 2) for a gothic appeal, and they, of course, must be DARK and PURPLE. So, in the pics you have posted, I ABSOLUTE love (from left to right, up and down): lipstick 1, 3 and 4. Eye make up 2, 4 and 5. I’m loving the dark lips, I’ve already started with mine- bought myself Rouge Noir lipstick and lipliner, they’re fab! I agree those sorts of colours can be unflattering for thin lips. What I used to do when I didn’t feel comfortable wearing a full-on dark lipstick was to put a balm or gloss all over my lips BEFORE the lipstick- that way you still get the overall feel of a dark lip, but it’s a more watered down and flattering version. Obviously it only lasts about 3 1/2 minutes before you need to reapply though! !